FANTASTIC FOUR Review | Warped Factor - Words in the Key of Geek. Comic book and superhero based films are among the hottest commodities in modern film making, and nearly any and every hero is being granted the chance to make at least one appearance on the big screen. In an attempt to capitalize on the love affair that the public has with these heroes, 20th Century Fox decided to give one of its superhero franchises, The Fantastic Four, a do over. The result is an insulting, disheartening abomination that rapes, ravages, and pillages the concept of one of the staple teams in Marvel Comic’s history. It’s an unjustifiable, disrespectful travesty that attempts to reboot and give an alternative perspective on the long tenured quartet that originally debuted in 1961. The film stars Miles Teller (Whiplash), Kate Mara (Deadfall), Michael B. Jordan (That Awkward Moment), Jamie Bell (The Eagle), and Toby Kebbell (Dawn of the Planet of the Apes), and is directed by Josh Trank (Chronicle). After a pair of moderately successful Fantastic Four films some years ago (2005, 2007), both of which were prior to the big boom in superhero movies, this revamp is darker, gritty, and far more serious in tone when compared to the prior iterations. In many ways this incarnation should be considered more of a “based upon” and not actual adaptation of the beloved heroes from the comics, as it only touches on the certain aspects of the team that define them. It does incorporate all of the essential characteristics of the team and their origin but tries to add a modernized twist to it. So we have the conjoined origins of the Fantastic Four and their arch nemesis, Doom, as well as the earliest beginnings of the love triangle between Reed Richards, Sue Storm, and Victor Von Doom. Beyond that, it doesn’t have much semblance to the super team that has thrived in the pages of the comics for some sixty plus years. There isn’t many positives about Fantastic Four. It’s a failure on a cataclysmic scale, and gets more depressing with each passing minute. However, the first half of the film is where it exhibits the most promise, in the moments featuring the earliest origin story for the foursome. This tragedy does give a great unseen deep perspective on the friendship of Ben Grimm and Reed Richards. It also embeds a number of witty early reference to the comics such as the "Flying Car" as well as trademark FF4 sayings such as “Its clobbering time" and "Flame on". Another positive is how they've incorporate the use of their suits into the origin of the quartet’s powers. But overall the film is oozing with flaws. The biggest is that the director and writers clearly don’t “get” the characters. Above all else, the FF4 is a family. In spite of the actual team not all being related, the FF4 has always had a strong sense of family embedded within it. That it is what defines them and what has helped to establish their legacy within the Marvel Universe. However, you never get a sense of that in this movie, and that is where it begins to fail first and foremost. In addition to that deficiency, it also doesn’t have the camaraderie needed to sustain the movie, there is only a limited love story between Sue and Reed, and no Johnny vs Ben brotherly love spats. Really there is next to nothing featured which makes the team who and what they are. Many people complained about the prior pair of films, but they both embedded a number of light hearted moments that really accentuated the story and helped to establish the camaraderie needed to truly give them the family feel of the team. 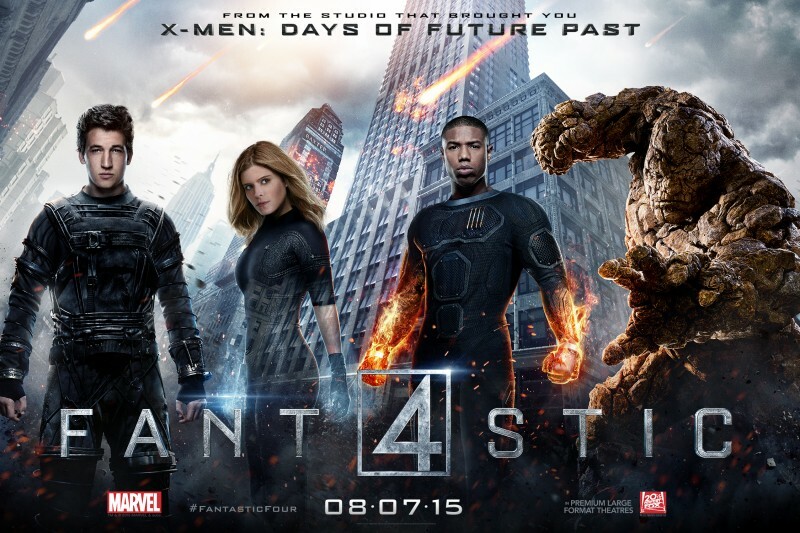 Fantastic Four is visibly absent of those, ultimately leaving the audience unsatisfied. This typhoon of despair is stockpiled with talent and completely squanders all of it. Many of its stars have flourished in other recent films which only adds to the unexplainable misuse of all the actors. From top to bottom, there isn’t one standout performance that even helps the film to be bearable. A lot was made of the change in ethnicity of Johnny Storm, but Michael B. Jordan brings NOTHING to the part other than the stereotypical role that we have seen all too often played by black actors - the hip-too-slick-black-guy that we have seen in far too many films, far too many times. Jordan was clearly not even close to the performance that Chris Evans gave in the other films. Evans version of The Human Torch was clearly the better of the two and the more enjoyable on screen. It's such as shame as I have seen many of Jordan's films and this movie does nothing to showcase his talent. Miles Teller, who has just received wide acclaim for his role in Whiplash, is reduced to playing a bland, dull Reed Richards. The FF4’s arch nemesis, Doom, and like the rest of the cast was completely mismanaged. Fantastic Four is easily one of the worst superhero movies to debut in some time. It’s a stinker of epic proportions. The movie exhibits some promise in the early moments, but by about the midpoint it quickly begins to dwindle, with the story moving at an abysmally slow pace. The re-invention of the origin is a nice touch but there is not enough of any character to really make the audience embrace it. The special effects are good but I attribute that more to the technology now instead of the film. This movie never really got the concept of the FF4 and features limited to no action. It’s befuddling how in the modern state of film making, where these types of movies are in high demand and the movie going population can’t get enough of them, that this film turned out the way it did. Fantastic Four is clearly not the worst superhero movie of all time but it’s fighting to break into the top 5.